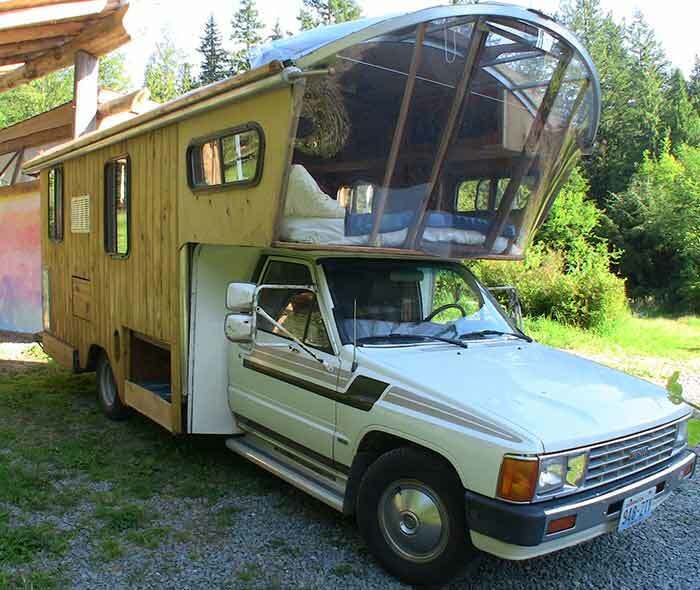 Inspired by gypsy caravans, Sunray Kelly took his vintage 1984 Toyota dolphin camper vehicle, deconstructed the camper shell, and built a canted-wall, curved-roof frame out of recycled aluminum. This camper is called the Gypsy Wagon, it’s got a wild new shape and a unique solar/electric/diesel hybrid power plant. The front camper window is really great looking that I imagine provides a great outside view from the inside. Short Bio: Truck Camper HQ Website moderator. Loves camping and especially love truck campers. If it has to do with a truck camper I want to know about it and share it with others.